A super walk from Little Salkeld visiting the Long Meg stone circle, the ancient church at Addingham and the fascinating red sandstone chambers of Lacy’s Caves. This was the first day of our holiday based in Armathwaite in the Eden Valley, Cumbria. As we couldn’t get into our cottage until 3pm in the afternoon I thought it would be nice to do this walk en-route. I’d long wanted to visit both Long Meg and Lacy’s Caves but it is quite a drive from home for such a modest walk. As it happened this was a perfect choice, we had some lovely sunshine, the walk was full of interest and we timed it perfectly so we did indeed arrive at Armathwaite virtually bang on 3pm! We parked the car on a verge just off the main road passing through Little Salkeld. Just below where we parked was a children’s play area and while I got my walking boots on Rhiannon went off for a swing. Setting off we followed the road north-east out of the village. After a short while we took an enclosed lane to our left which cut out a road junction. Emerging on to a narrow road we followed this up to Long Meg and her Daughters. 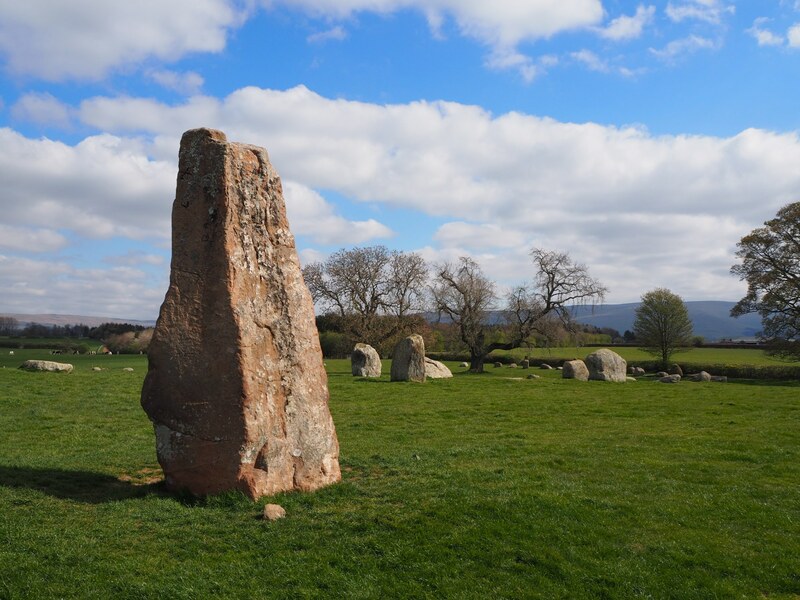 Long Meg and her Daughters is the name given to a huge stone circle. Reputedly the second largest stone circle in England it is about 5,000 years old and features over 60 stones. At its widest point the stone circle’s diameter is about 300ft. Whilst most of the stones are made of shap granite Long Meg herself is a 12ft high sandstone monolith. Long Meg is situated a short distance outside of the circle and features some cup and ring marks. After spending a while exploring the rocks we continued on our way by taking a bridleway heading north-east along the edge of a wood. Swinging north to cross the access road to Maughanby Farm it brought us to the Church of St Michael and All Angels at Addingham. The church serves the villages of Glassonby, Hunsonby, Winskill and Little Salkeld. The village of Addingham itself is long since gone having been washed away by the River Eden in the 14th century. From the church we took a lane to the left descending between trees to reach a junction. Turning right we continued a gentle descent through woodland. Continuing north the path became enclosed by a colourful hedgerow with flowering blackthorn. Arriving at a road we turned down it as far Daleraven Bridge. Without crossing the bridge we took a footpath signposted to the left. This climbed up a pasture before suddenly arriving at a high bank above the River Eden – a glorious moment. Dropping down the path a short way we stopped to eat our picnic enjoying fine views of the river. After our refreshment we continued heading south alongside the river. The path soon got quite moist and entering the woods long sections of duck boards helped keep our feet dry. After a section where the path climbed up and then back down to the river a sharp turn to the right brought us to Lacy’s Caves. Lacy’s Caves are a series of natural red sandstone caves above the riverbank that were enlarged by Lt. Col. Samuel Lacy of Salkeld Hall in the 18th century. Now a series of chambers and openings it is a fascinating place to explore. Over the centuries visitors have left a mass of graffiti carved into the spectacular red rock. Care does need to be taken as there are some steep drops down to the river but other than a visit is highly recommended. Returning to the main path we continued heading south. A brief detour to the right at some old mine buildings provided a good view of a series of small waterfalls below Force Mill. A bit further along the path, which here follows the course of an old tramway, we also got glimpses of Longmeg Viaduct over the river. At the end of the woods the path was forced around the outside of a sub-station to reach an access road. This was our route all the way back to Little Salkeld. For most of the way the road shadows the course of the Settle-Carlisle railway and we got an added bonus when a steam train, ‘Tornado’, rattled past below us. With some nice final views across the river towards Great Salkeld the road brought us back to the start and the end of a fabulous outing.